2018: The Biggest Year for Open Source Software Ever! Open Source Software (OSS) businesses have experienced massive exits throughout 2018. Mega-acquisitions like Salesforce buying MuleSoft for $6.5B and large IPOes like Pivotal at $3.9B underscore the market’s appetite for open source startups. Last week Elastic filed its S-1 and has the potential to achieve a +$3B IPO. In addition to Elastic, there is a healthy pipeline of high growth later stage OSS startups that will likely exit at unicorn valuations. The impressive exits demonstrate OSS startups can achieve outsized returns, and 2018 will be remembered as the year of OSS. Historically the market for large scale acquisitions of OSS businesses was just OK. In January 2008 Sun Microsystems acquired MySQL for $1B, the largest OSS acquisition up till then. MySQL’s acquisition validated the possibility that an OSS business could achieve a three-comma exit. 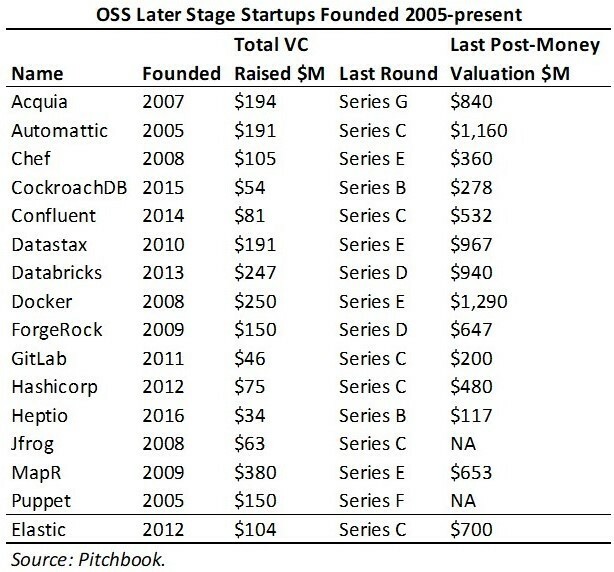 Since then, OSS businesses have continued to be acquired but usually for $250M or less. Red Hat is one of the most active acquirers and has bought CoreOS, Ansible, Inktank Storage, and Gluster. 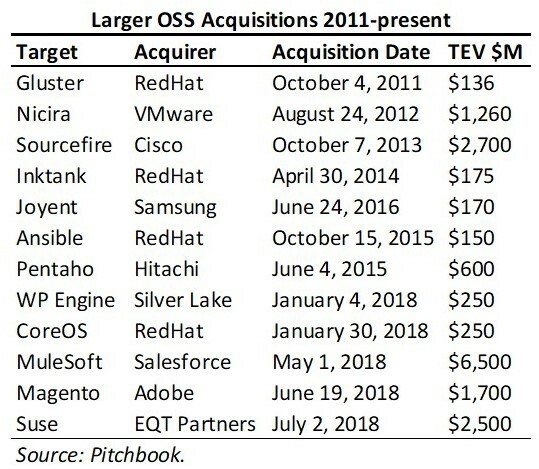 2018 is a break out year for OSS acquisitions. Three seven figure acquisitions occurred over the past three months including MuleSoft, Magento, and Suse. The $6.5B MuleSoft acquisition is also the largest ever achieved in the category. Before the recent buying spree, it was almost five years ago, in October 2013, when Cisco acquired Sourcefire that an OSS business was bought for over $1B. In July Microsoft acquired GitHub, a git-based code sharing and collaboration service that hosts +29M public repositories, for $7.5B. While not an OSS startup directly, GitHub is at the center of the OSS ecosystem, and the huge acquisition highlights the market’s vibrancy. Six OSS businesses IPO-ed over the past four years. On April 20, 2018, Pivotal achieved the largest OSS IPO ever with a $3.9B TEV at the end of its first day of trading. Previously Red Hat’s August 11, 1999 public offering valuing the business at $3.4B TEV held the record for the largest OSS IPO. It took almost 20 years for Pivotal to break Red Hat’s record. Last week Elastic, a data search solutions startup, unveiled its S-1 and plans to raise about $100M. Over the last twelve months (LTM) Elastic achieved $185M in revenue, above the cohort median of $156M. The company’s 79% YoY growth is also higher than the group median of 64%. Elastic’s LTM revenue and growth rate most closely mirrors MuleSoft. Applying MuleSoft’ first trading day 17.4x TEV/LTM revenue to Elastic’s $185M LTM revenue suggests a $3.2B TEV. According to Pitchbook, Elastic’s last private post-money valuation was $700M so theoretically there is a 4.6x upside. In addition to Elastic’s upcoming public offering, there is a strong pipeline of at least 15 OSS businesses that could IPO. Many of them have already achieved a $500M post-money valuation. 2018 has been the hottest year for OSS exits ever. From MuleSoft’s acquisition to Pivotal’s IPO, the market has been on fire. We have our eye on Elastic’s upcoming IPO, and the strong pipeline of potential IPO candidates. The days of questioning whether open source business models could achieve returns expected by venture capitalists are over. It is clear OSS startups can evolve into large enduring businesses with outsized exits.